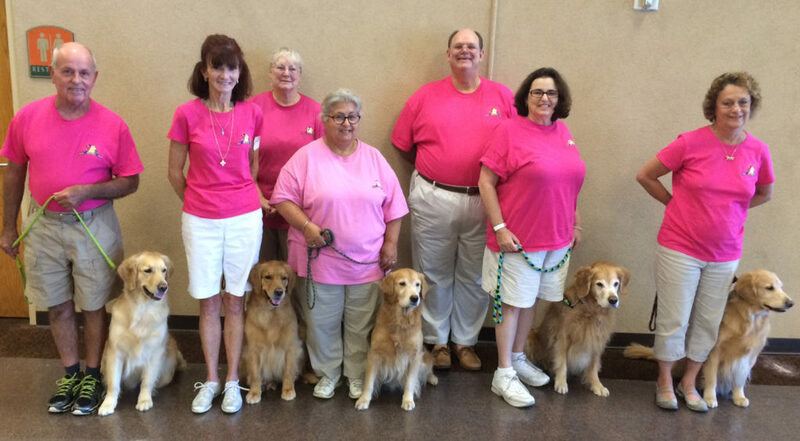 This team of five members of the Mid-Florida Golden Retriever Club competed in the annual DOCOF (Dog Obedience Clubs of Florida) tournament held at Osceola Heritage Park in Kissimmee, Florida, Sept. 3-4. Left to right are John Thibodeaux and Smooch; Dee Thibodeaux and Sizzle; Michele Panetta and Elle; Deena Strauss and Bentley; and Camille N. Doehring and Olivia. Back row are club members Charlie and Susan Hicks who volunteered to help the team during the tournament.